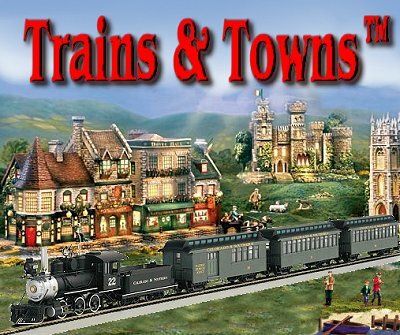 The Trains and Towns mailing list is available on an "opt-in" basis only. We use the list to help people who are trying to learn about or get started with trains, especially trains that are O scale or larger. In fact, we develop a personal (if long-distance) relationship with many of the people on our list, as we all help each other build the hobby. We certainly don't want to force that on anybody. In other words, if you're on this list it's likely that you, or someone with access to your e-mail account asked to be put on this list, or on the Big Christmas Trains™ mailing list that preceded it. But all you have to do to get off is ask. The quickest way to unsubscribe is to enter the e-mail you want to unsubscribe into the following form and click on the gray "submit query" box. Your name and any comments are totally optional, but appreciated. Either way, we certainly hope that all is well with you and your family, and we will still be glad to hear from you and to answer any questions that come up. Note: Big Indoor Trains™, Big Train Store™ Family Garden Trains™, Big Christmas Trains™, Garden Train Store™, and Trains-N-Towns™ are trademarks of Breakthrough Communications™ (www.btcomm.com). All information, data, text, and illustrations on this web site are Copyright (c) 1999, 2000, 2001, 2002, 2003, 2004, 2005, 2006, 2007, 2008, 2009, 2010, 2011, 2012 by Paul D. Race. Reuse or republication without prior written permission is specifically forbidden.